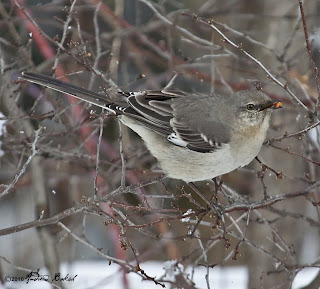 Took some photos today of a few birds in the backyard while shoveling out snow and replenishing feeders. 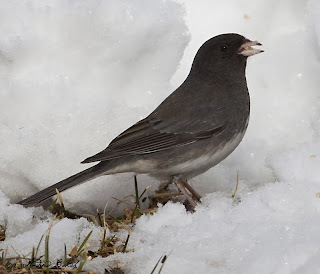 I observed a total of 16 species, not bad for a snow filled day. Enjoy the photos! 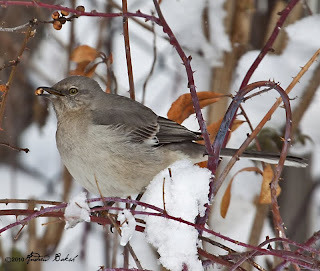 Northern Mockingbird scrounging for winter berries. 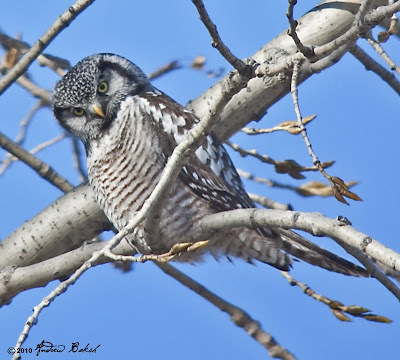 Here are some photos of the Northern Hawk Owl seen in Clinton New York. This bird was our first and most important target bird of the Adirondack trip, which we got on day 1. 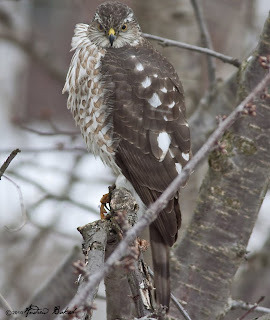 I had to be very selective of the photos to post because my captures took place just after the Hawk Owl had captured a Vole, which it then proceeded to eat. Here are a few. Our last day in the Adirondacks, started off in spectacular style, which has a story behind it. The day before, I had engaged a volunteer at the Paul Smith's VIC in a conversation on the pressure the center was facing with regards to budget cuts and the threat of closing. That conversation led to talking about birds we were trying to see. 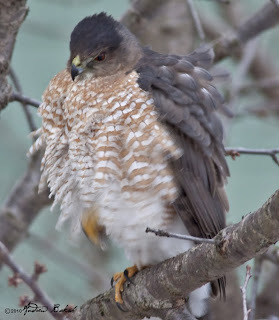 Evening Grosbeak and Gray Jay were our target birds at Paul Smith's and neither showed. When I mentioned both birds, Nancy, the volunteer extended an invitation to the group to visit her home where she had "42" Evening Grosbeaks showing up at her feeders. You bet, I accepted her offer. 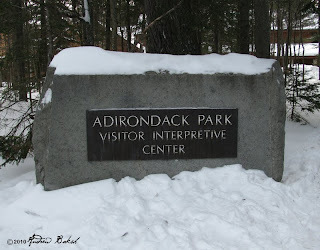 I called Joe over and he was open to the idea, so we got the address and directions, with the caveat that it was in the Adirondack, so finding the location by GPS would not be easy. That night we ended up calling Nancy and reviewing the directions with her husband Jim, because we had difficulty mapping it out. It all worked out. 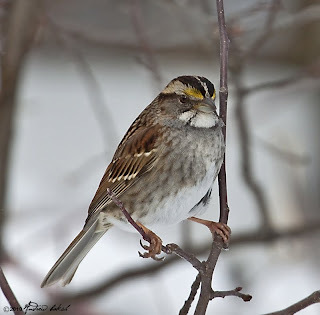 Jim, met us at an intersection and guided us to his home and like Nancy had promised, there was a flock of Evening Grosbeaks around her house. As soon as we exited our vehicles we heard them. What a thrill that was to hear and see them. It would have been nice to sit around for a good photo, but we were under strict time management since we wanted to make few more stops along the way back to NYC. It was the third day in a row we had started the day with a spectacular bird. Huge, huge thanks and appreciation to Nancy and her husband Jim for their generosity (we could not stop talking about their kindness). After reluctantly saying goodbye to Jim and Nancy, we made a quick stop at a local eatery, Gus' Diner, for a bite and then we were on the road again. Our next stop was at the Newcomb VIC. Here we picked up more birds and had another look at Evening Grosbeaks; this time, we were able to get some photos. A nice addition to the trip list was Purple Finch another species like the Pine Siskin that has not been reported (as far as I know) in the 5 boroughs of NYC, so far this Winter. From Newcomb, we headed to Fort Edwards adding birds like Pileated Woodpecker and Red-shouldered Hawk as we birded along the way . 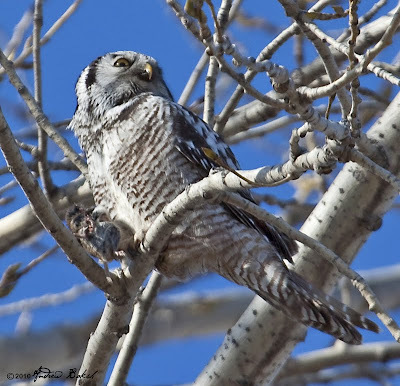 At Fort Edwards, we were looking for grassland birds specifically, Rough-legged Hawk and Short-eared Owl. We got the Rough-legged Hawk very quickly, but had to wait until dusk for Short-eared Owl, which we got. Then it was the long haul back to NYC concluding a very successful trip! This morning we set out early on our second day in the Adirondacks in upstate NY. We decided to take a chance and try for the Northern Shrike that we learned was seen on the 14th, right near where we got the Northern Hawk Owl on the 15th. Luck was on our side. 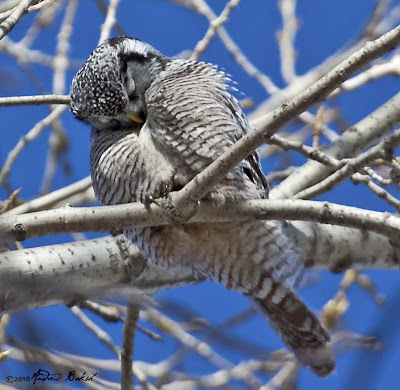 We got another look at the Northern Hawk Owl as I was able to pick it up along the road we where we had it the day before. A few minutes later, I picked up a Northern Shrike west of where we had seen the Hawk Owl and got everyone on the bird for good scope view. We were all thrilled as we had picked up both birds quickly. From there we went on to Paul Smith's VIC hoping for Boreal Chickadee and Gray Jay, but dipped on both. However, we were able to pad our trip and day list with a couple of species. Leaving Paul Smith's, we ended up on Bigelow road where after about 3/4's of a mile in on the trail we found another target bird. Boreal Chickadee and it was Sam who spotted one among a flock of Black-capped Chickadees. It was some spotting given the light and angle. We were besides ourselves. A few minutes later, we had a new trip bird as I picked out a Pine Siskin that had arrived in a flock of Goldfinches; we and ended up with two Siskins for the day. Later in the afternoon, on the other side of Bigelow, we picked up a Black-backed Woodpecker. By then the light was fading and we called it a day. An upstate trip came together within days and so early yesterday, I joined Joe Guinta and Sy Schiff on a 300 + miles excursion to upstate NY. We were later joined by Sam Janazzo. 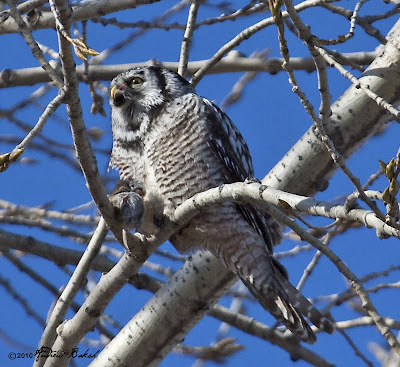 350 miles later, both groups met up in Champlain NY, where in a matter of 10-15 minutes were on a Northern Hawk Owl. We had outstanding looks of this bird. I would have liked to have observed this bird some more especially watching it hunt, but an overzealous neighbor ruined the moment. Nevertheless, I got some decent photos, which I will post once I have a chance to look at them. 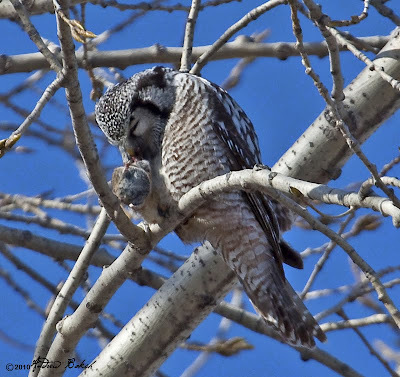 There was a possibility that we could have added a few more birds in the area as we received intelligence that there were 2 Northern Shrikes and Ruffed Grouse seen in the same location as the Owl. However, the intelligence was received late and we had already left the area. Last night during dinner we plotted our route for today and it remains to be seen if we would deviate from our route to do the 20 miles drive to the spot to try for the Shrikes and Grouse. 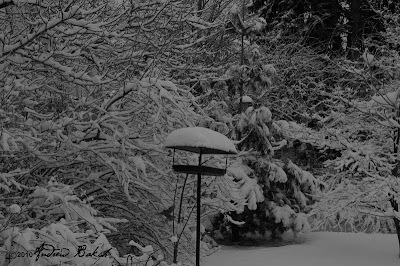 Photos taken yesterday in the backyard during the winter storm. 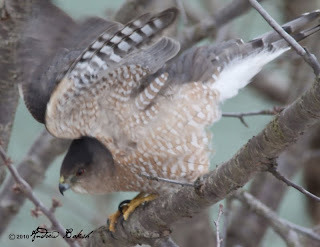 Part 1 "On the Road to Massachusetts"
Part II "Luck and Time Management"
Part III "Grace Under Pressure"
Please refer to the above links for Parts 1-3 on on the Massachusetts Super Bowl of Birding. We had to keep moving so we pressed on to Salisbury and Newburyport. Christopher, reminded us that we were getting close to areas where he knew Turkey Vultures roosted and it was John who picked them up, our second 5 pointer of the day. We continued on to Salisbury State Park, picking up Bald Eagle, Horned Larks, American Tree Sparrow, Savannah Sparrow and finally Long-tailed Duck, which was picked out by Chris. We missed out on Merlin, Snow Bunting, and Lapland Longspur. An attempt was made to locate Common Merganser at a location that Chris and Nate had scouted and found the day before. 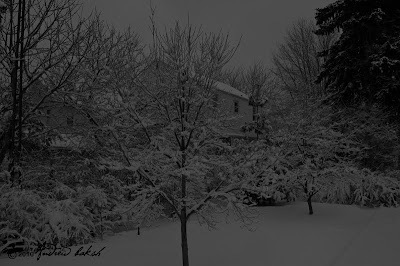 Unfortunately, we could not find any - very likely because of the icy conditions. Undaunted, we continued to Plum Island picking up American Kestrel along the way. 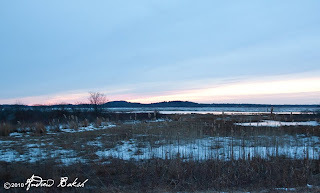 At Plum Island, we added Snowy Owl and Rough-legged Hawk to our list and tried hard for a Northern Shrike, but all we got were Robins and Mockingbirds. We also made an attempt at finding Red-breasted Nuthatch; however, we were unable to access the road where the chances were best and so came up empty. A bird on the ground got us a bit excited when we thought we had a Short-eared Owl, but it turned out to be a Northern Harrier. 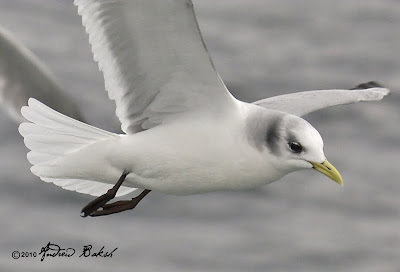 With time winding down, we made a team decision to do a quick sea watch and it paid off when we were rewarded with our first White-winged Gull of the day found by Nate, it was an Iceland Gull. Feeling lucky we again tried for a Short-eared Owl with the remaining time we had left. Unfortunately time was not on our side and we ended up missing on SEO, but watched a beautiful sunset as time ran out. It was 5:00 p.m. the competition was over. We had our moments of fatigue, but thank goodness for Dunkin Donuts and Corey's potato bread, peanut butter and honey, which gave us much needed bursts of energy. Amazingly, the team was held it together staying sharp and focused despite the long haul. A tremendous effort by all! We went to the compilation dinner happy to take a load off. The pizza provided by our hosts was a welcome sight for a bunch of hungry birders and went down without a fuss. Before the winners were announced there were some prize giveaways determined by lottery tickets given out as we entered the room. It was pretty cool when they called out a winning ticket number that was held by teammate Mike Powers. From L-R John, Mike displaying his prize and Chris all smiles. 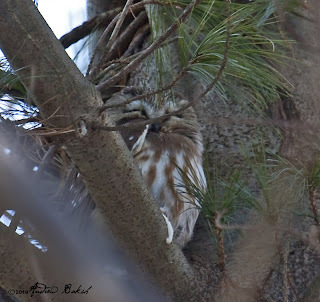 Picking up from my last post on the MA Super Bowl of Birding. From Nahant, we moved on to our other locations in Gloucester. It took some maneuvering to get into the right spot to get the Peregrine Falcon whose location was well scouted by Chris. Another tick and we were on the move again, this time to a location knows for Gulls. We were hoping for White-winged Gulls and I was hoping that we could find something good to make up for the missed 5 pointers. Alas, we only picked up Ring-billed, Herring and Greater-black Backed Gulls. Chris and Corey at one point thought they had an Iceland Gull in flight, but we could not find it even after relocating to a spot that should have given us all a better look. 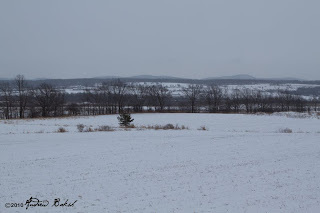 We had to keep moving so, we headed to our next location where it was the coldest of the day; nothing like what I had already faced during the Southern Nassau and Captree Christmas Bird Count back in NY, but it reminded me of those days. Adding to the cold was a haze/shimmer that made it very difficult to make out what else might be hanging out with the Purple Sandpipers on the far rocks. 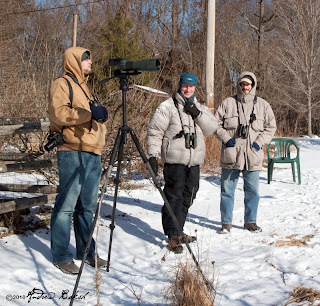 From there, we headed to Niles or Nyles Pond; this was the location that Corey and I had kept a close eye on, monitoring the reports out of MA with regards to the Slaty-backed and Thayers Gull. With the cold, we all knew it was a long shot if the pond was frozen over but we headed there anyway. As luck would have it and this is a big part of this competition, we got neither. There were a few Gulls around but nothing to add to the species list. This was a blow, but again we sucked it up and remained positive. Someone started talking about "Positive Thinking" and Oprah Winfrey was referenced. We continued along our route picking up Wild Turkey, Black Scoter and a Cooper’s hawk that Mike and I both called as we drove right by it. A backup, forward, stop and pullover a few minutes later had us all on the bird. We continued on and made a stop near the ELK club where we looked for a King Eider that was known to be in the area. No King Eider, but we found several Black Guillemots. I counted a total of 5 in that location and for some team members the Guillemot was a lifer. A few minutes later, I picked up a flock of (11) shorebirds (9) that turned out to be Sanderlings and the other 2 were Rudy Turnstones, one stayed with the flock and we all got on it for a 4 pt. bird. At that same location Mike picked up a Murre way out despite the shimmer. Sea watching requires a lot of patience and concentration and it was an impressive feat - a very good find. The other team members all got looks and after some contemplation, it was agreed that it was a Thick-billed Murre. With the Thick-billed Murre, Corey and I had now swept the East Coast Alcids - not an easy accomplishment. At this same location were a number of Harlequin Ducks, which always get the Ooohs and Aaahs, but that day there was no time for that. It was all about focusing on finding birds and so off we went. 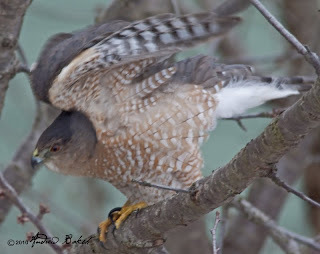 Before we walked away, Nate called our attention to a Northern Flicker that was flying right above us – where it came from we could only speculate. And so it was onward again; our time management had paid off, we were doing well within the time frame we had allotted ourselves to the stops. 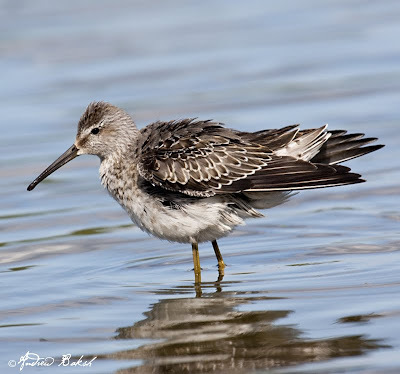 We made a quick stop at Harbor Beach and patience paid off when I stayed with a bird that I had seen flying into a shrub as we got out of the van. I lingered behind, as the group moved towards the beach and Corey who had stayed behind, got on the bird with me as it finally showed. A Yellow-rumped Warbler; we got enough of us on the bird to count it as a 3 pt bird. 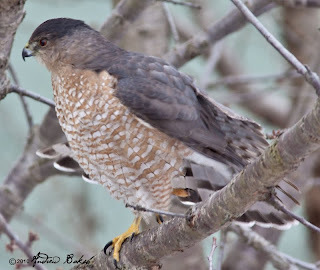 Yesterday, in about an hour after the Sharp-shinned Hawk had departed from its stakeout (see the post below), another accipiter showed up in almost exactly the same spot. Same tree, just setting up shop on the branch above where the Sharp-shinned had been. Interestingly, the small birds came out and foraged - something they did not do when the Sharp-shinned was around. 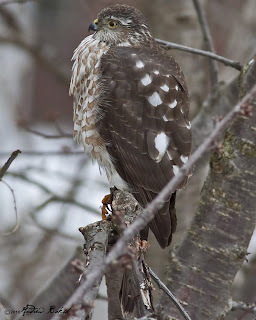 Again, rather than ID this hawk, I will give my readers a chance to get the species type. Enjoy the photos! Look out below here I come! You had better be afraid! Ha! You guys always fall for it...I was just stretching. See, I could do this standing on one leg too. With weather updates constantly changing on how much snow was expected, I decided to ride out the morning to see what played out. 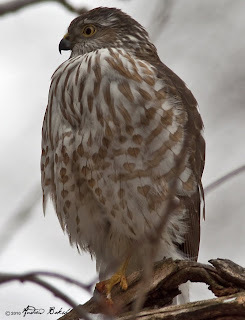 Keeping an eye out in the backyard, paid off as I noted an accipiter staking out the feeding stations. The bird took off before I could get any photos, but I was not worried as I figured it was circling around for another run as part of its hunting strategy. I guessed correctly, as I noted the bird about an hour later in the exact same spot and this time I was able to get some decent photos. I started to name the Hawk, but decided I would give readers a chance to make the ID...though I know some of you probably read my comment earlier today and may already know :) Enjoy! 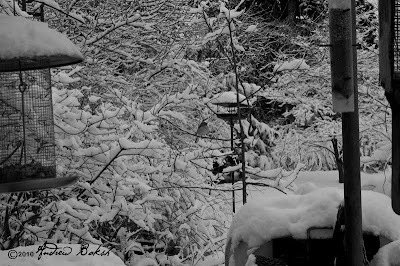 Looked out this morning and saw this hawk scoping out the feeding stations. The Cherry tree is a favorite spot for an ambush. I have refrained from any trimming that would allow me clear shots. 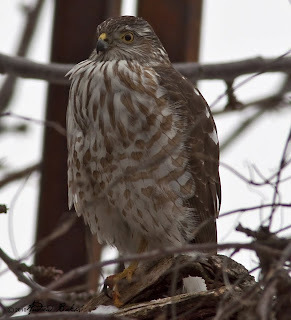 Last winter, I had a juvenile accipiter that came in and watched me re-fill feeders. Before I continue this report, let me say that I will do my best to mention locations, but please note that this was a fast paced competition and I was more focused on finding birds rather on taking notes. Also, there will be instances where I will deliberately omit the location names only because I am already thinking of next year’s competition. The morning of the competition came and everyone was up on time and getting their gear together. We quickly loaded up and were on our way to our first stop. We got to our first location which was Flax Pond and immediately could make out a few species on the pond, but we could not count them as it was too early to start the count. As soon as 5:00 a.m. arrived, we piled out and began our species count, Mute Swan, Mallard, Black Duck, Hooded Merganser and the coveted (4 pt.) American Coot we all nailed within minutes. One species we looked for and did not find was the Wood Duck. It was a good start! From there we tried for Owls, with Nate and Corey leading the way. They both gave it a good effort, but it was quiet as far as Owls responding. Chris had warned us that during his scouting expeditions, he had found the Owls to be very quiet. Even so, we were disappointed that we did not get the response we wanted. Finally, at one location we got a Screech Owl to respond and that helped ease the sting a bit. From there, it was on to another location named Nahant. Along the way we stopped at several spots birding the coastline picking up Common and Red-throated Loon, Horned Grebe, Red-necked Grebe, Surf and Black Scoters and Red-breasted Merganser to name a few. In addition, we picked up Brandt, a species that was missed by last year’s team. As we birded along the coast, we kept working the thickets for land birds, but there was little to no activity. Moving inland, we made a couple of stops, the first one was dead and I mean dead. 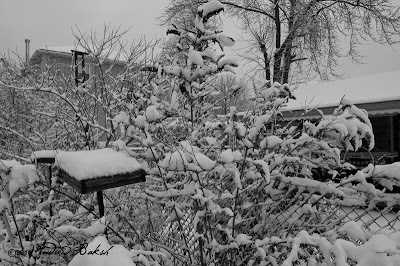 The habitat looked right for Sparrows, but all we pulled out of that area was a Downy Woodpecker. We quickly moved on to our next stop and immediately while parking we picked up Robins and heard Carolina Wren. Working that area, we picked up a number of species including American Goldfinch, Northern Cardinal, Northern Mockingbird, Tufted Titmouse, Black-capped Chickadee, White-throated Sparrow, Mourning Dove, House Sparrow, House Finch to name a few. 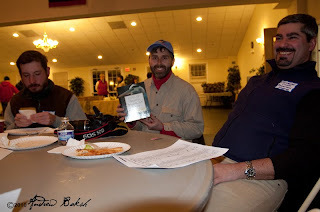 When I received the invite from Christopher of Picus Blog back in October of 2009, I was surprised, but excited that I would be considered for an invite to the Superbowl of Birding event in Massachusetts. My quick response was a tentative "yes". Things began to fall into place and in a matter of months my tentative became a confirmation and I was set to bird with a power house line-up. From L-R Corey, Rob and John. 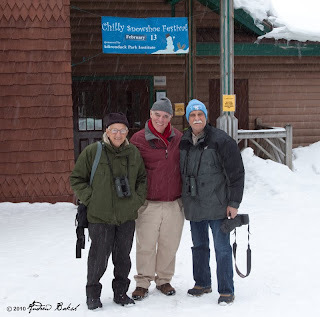 Very quickly, the Superbowl of Birding weekend was here. On Friday, I picked up Corey of 10000birds and after getting the rental van we picked up John of A DC birding Blog, who had taken mass transit in from NJ and we were on our way. As birders do, we had scouted potential birds we could squeeze in along the way and we settled on trying for a Yellow-headed blackbird that was showing up at the Pyrun Nature Sanctuary. 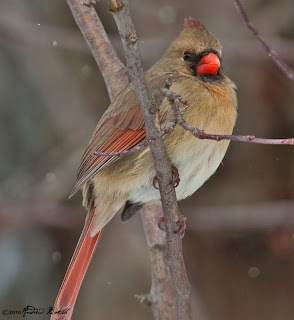 Getting this bird, was going to be a long shot, since it had not established a set pattern for visiting the feeders, save for two sightings in the afternoon, but we were going to try. Despite standing around for about an hour and a half we dipped on the YHBB, but had nice looks at many others. Corey was especially happy as he was able to beef up his county (Westchester) list. I also met a friend of mine there, Rob Bates, who was also trying for the YHBB, but even with the extra pair of eyes, this bird was not seen. Note, I did not hear from Rob after we left, so I am assuming that he did not get the bird either. After Corey had his fill of Westchester county pickups...I mean after awhile. We continued on, picking up many day list species including Red-tailed Hawks and Turkey Vultures. We arrived in MA making excellent time and headed straight to where we would be staying at the Staybridge Suites in Burlington. There, we awaited the other members of our team that included, Christopher, Nate of The Drinking Bird and Mike of The Flower and the Feather . Once they arrived we checked into our room. Coincidentally, we ended up with the same room the team had last year and we all mused whether this was a good or bad omen. 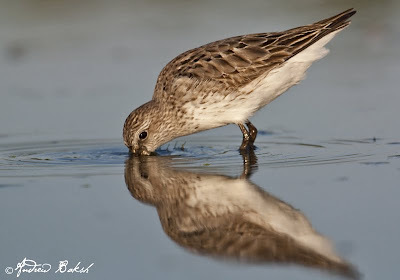 Once we drew straws (more like first dibs) on who was sleeping where, we headed out for some birding. Christopher being the good host had a Northern Saw-whet-Owl lined up for us and we had good looks and photo opportunities. Owls are always cool to look at and this was no exception. For Nate and John this was a special moment as it was a lifer for both. Once the Owl viewing was over, we headed over to another location where after some patience we were rewarded with a really neat bird. One that will have to remain secret until further notice. Then, it was onto dinner and back to the hotel to plan out the strategy for the next day. Next up, "Super Bowl Day."